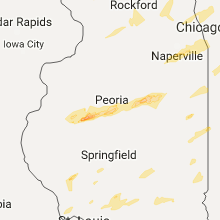 The Minooka, IL area has had 12 reports of on-the-ground hail by trained spotters, and has been under severe weather warnings 6 times during the past 12 months. 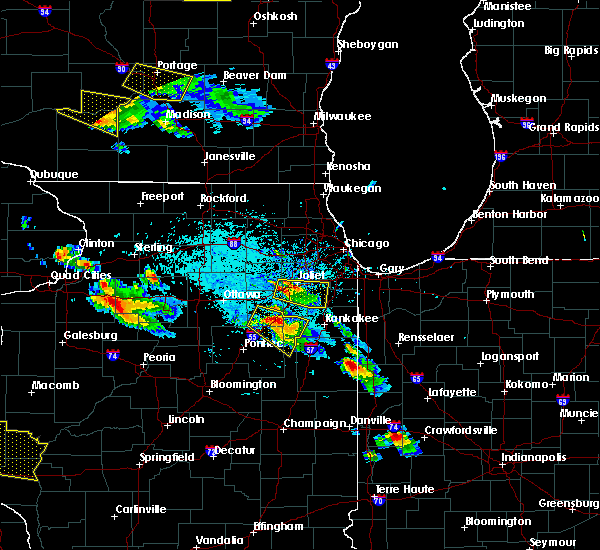 Doppler radar has detected hail at or near Minooka, IL on 52 occasions, including 2 occasions during the past year. 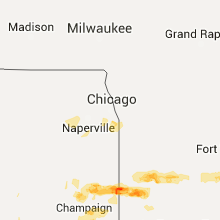 3/14/2019 11:54 AM CDT At 1153 am cdt, a severe thunderstorm was located near minooka, moving northeast at 45 mph (radar indicated). Hazards include 60 mph wind gusts and quarter size hail. Hail damage to vehicles is expected. Expect wind damage to roofs, siding, and trees. 3/14/2019 11:45 AM CDT At 1145 am cdt, a severe thunderstorm was located over morris, moving northeast at 45 mph (public). Hazards include 60 mph wind gusts and quarter size hail. Hail damage to vehicles is expected. expect wind damage to roofs, siding, and trees. Locations impacted include, morris, channahon and minooka. 3/14/2019 11:32 AM CDT At 1131 am cdt, a severe thunderstorm was located near mazon, or 7 miles southeast of seneca, moving northeast at 55 mph (radar indicated). Hazards include 60 mph wind gusts and quarter size hail. Hail damage to vehicles is expected. Expect wind damage to roofs, siding, and trees. 9/25/2018 5:33 PM CDT At 532 pm cdt, severe thunderstorms were located along a line extending from 8 miles east of north chicago to near kenilworth to ingalls park, moving east at 50 mph (radar indicated). Hazards include 60 mph wind gusts. Expect damage to roofs, siding, and trees. 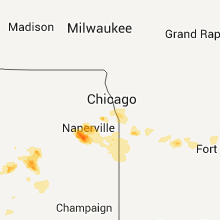 Locations impacted include, chicago, aurora, joliet, naperville, cicero, arlington heights, evanston, schaumburg, bolingbrook, skokie, des plaines, orland park, tinley park, oak lawn, berwyn, mount prospect, wheaton, oak park, downers grove and glenview. 9/25/2018 5:16 PM CDT At 515 pm cdt, severe thunderstorms were located along a line extending from green oaks to glenview to near shorewood, moving east at 60 mph (radar indicated). Hazards include 70 mph wind gusts. Expect considerable tree damage. damage is likely to mobile homes, roofs, and outbuildings. 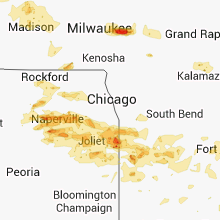 Locations impacted include, chicago, aurora, joliet, naperville, elgin, waukegan, cicero, arlington heights, evanston, schaumburg, bolingbrook, palatine, skokie, des plaines, orland park, tinley park, oak lawn, berwyn, mount prospect and wheaton. 9/25/2018 4:52 PM CDT At 448 pm cdt, severe thunderstorms were located along a line extending from near woodstock to near elgin to near serena, moving east at 50 mph (radar indicated). Hazards include 70 mph wind gusts. Expect considerable tree damage. Damage is likely to mobile homes, roofs, and outbuildings. 7/23/2017 5:42 PM CDT At 542 pm cdt, a severe thunderstorm was located over shorewood, or near minooka, moving southeast at 20 mph (radar indicated). Hazards include 60 mph wind gusts and quarter size hail. Hail damage to vehicles is expected. Expect wind damage to roofs, siding, and trees. 7/19/2017 9:56 PM CDT At 955 pm cdt, severe thunderstorms were located along a line extending from near harwood heights to country club hills to 6 miles east of lakewood shores, moving southeast at 50 mph (radar indicated). Hazards include 60 mph wind gusts. Expect damage to roofs, siding, and trees. Locations impacted include, chicago, joliet, cicero, evanston, bolingbrook, skokie, des plaines, orland park, tinley park, oak lawn, berwyn, mount prospect, oak park, downers grove, elmhurst, lombard, romeoville, park ridge, addison and lockport. 7/19/2017 9:40 PM CDT At 940 pm cdt, severe thunderstorms were located along a line extending from elk grove village to lemont to near diamond, moving east at 50 mph (radar indicated). Hazards include 60 mph wind gusts. Expect damage to roofs, siding, and trees. Locations impacted include, chicago, aurora, joliet, naperville, cicero, arlington heights, evanston, schaumburg, bolingbrook, skokie, des plaines, orland park, tinley park, oak lawn, berwyn, mount prospect, wheaton, oak park, downers grove and elmhurst. 7/19/2017 9:23 PM CDT At 922 pm cdt, severe thunderstorms were located along a line extending from near carol stream to near plainfield to 6 miles northwest of morris, moving southeast at 50 mph (radar indicated). Hazards include 60 mph wind gusts. Expect damage to roofs, siding, and trees. 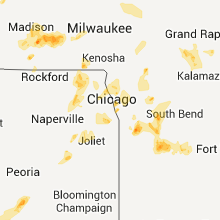 Locations impacted include, chicago, aurora, joliet, naperville, cicero, arlington heights, evanston, schaumburg, bolingbrook, skokie, des plaines, orland park, tinley park, oak lawn, berwyn, mount prospect, wheaton, oak park, downers grove and elmhurst. 7/10/2017 10:09 PM CDT The severe thunderstorm warning for southeastern kendall and northeastern grundy counties will expire at 1015 pm cdt, the storm which prompted the warning has weakened below severe limits, and has exited the warned area. therefore, the warning will be allowed to expire. 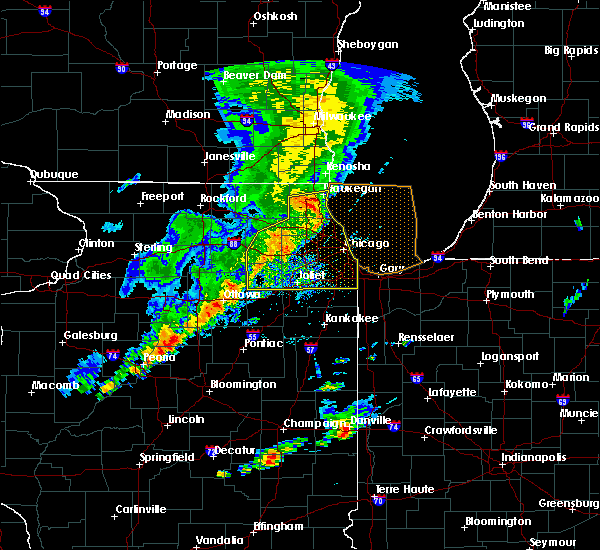 a severe thunderstorm watch remains in effect until 1100 pm cdt for northeastern illinois. 7/10/2017 10:01 PM CDT At 1001 pm cdt, a severe thunderstorm was located near shorewood, or near minooka, moving east at 30 mph. this storm has shown a gradual weakening trend (radar indicated). Hazards include 60 mph wind gusts and penny size hail. Expect damage to roofs, siding, and trees. Locations impacted include, joliet, channahon and minooka. 7/10/2017 9:48 PM CDT At 948 pm cdt, a severe thunderstorm was located 7 miles east of newark, or 8 miles south of yorkville, moving east at 30 mph (radar indicated). Hazards include 60 mph wind gusts and quarter size hail. Hail damage to vehicles is expected. expect wind damage to roofs, siding, and trees. 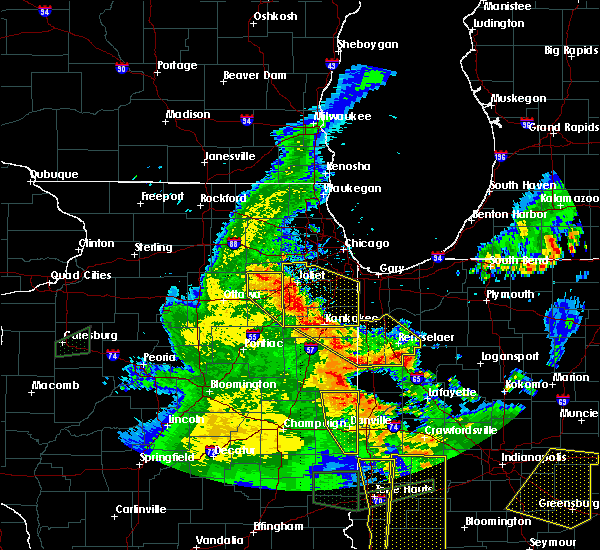 Locations impacted include, joliet, yorkville, morris, channahon, minooka and lisbon. 7/10/2017 9:34 PM CDT At 933 pm cdt, a severe thunderstorm was located near newark moving east at 30 mph (radar indicated). Hazards include 60 mph wind gusts and half dollar size hail. Hail damage to vehicles is expected. Expect wind damage to roofs, siding, and trees. 6/14/2017 5:12 PM CDT The severe thunderstorm warning for kendall, northeastern livingston, northeastern la salle, western will, grundy and western kankakee counties will expire at 515 pm cdt, the leading edge of the storms which prompted the warning have shifted northeast of the warned area. therefore, the warning will be allowed to expire.however gusty winds to 55 mph are still possible behind the leading edge of thunderstorms, and some tree damage is still possible. 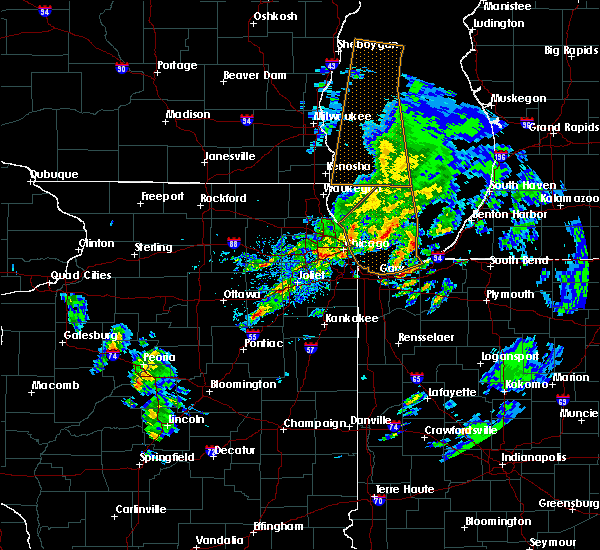 a severe thunderstorm watch remains in effect until 800 pm cdt for central, north central and northeastern illinois. 6/14/2017 5:03 PM CDT At 502 pm cdt, severe thunderstorms were located along a line extending from near sugar grove to shorewood, moving northeast at 55 mph (trained weather spotters). Hazards include 70 mph wind gusts, and hail to the size of pennies. Expect considerable tree damage. Damage is likely to mobile homes, roofs, and outbuildings. 6/14/2017 4:54 PM CDT At 453 pm cdt, severe thunderstorms were located along a line extending from yorkville to near coal city to odell, moving east at 55 mph (trained weather spotters). Hazards include 60 mph wind gusts and penny size hail. Expect damage to roofs, siding, and trees. Locations impacted include, joliet, bolingbrook, romeoville, plainfield, lockport, new lenox, yorkville, morris, channahon, minooka, marseilles, dwight, seneca, wilmington, ingalls park, shorewood, manhattan, braidwood, coal city and diamond. 6/14/2017 4:39 PM CDT At 437 pm cdt, severe thunderstorms were located along a line extending from near leland to near seneca to near flanagan, moving east at 60 mph (trained spotters reported). Hazards include 60 mph wind gusts and quarter size hail. Expect wind damage to roofs, siding, and trees. Large hail is also possible. 5/18/2017 12:13 AM CDT At 1213 am cdt, severe thunderstorms were located along a line extending from downers grove to near romeoville to minooka, moving northeast at 50 mph (radar indicated). Hazards include 60 mph wind gusts. Expect damage to roofs, siding, and trees. locations impacted include, aurora, joliet, naperville, bolingbrook, downers grove, romeoville, plainfield, lockport, lisle, morris, channahon, minooka, seneca, woodridge, shorewood, rockdale, crest hill, glenbard south and crystal lawns. A tornado watch remains in effect until 100 am cdt for north central and northeastern illinois. 5/18/2017 12:05 AM CDT At 1204 am cdt, severe thunderstorms were located along a line extending from naperville to plainfield to near minooka, moving northeast at 55 mph. the strongest winds are headed towards plainfield (radar indicated). Hazards include 70 mph wind gusts. Expect considerable tree damage. damage is likely to mobile homes, roofs, and outbuildings. locations impacted include, aurora, joliet, naperville, bolingbrook, wheaton, downers grove, romeoville, plainfield, oswego, glen ellyn, lockport, lisle, yorkville, morris, channahon, minooka, seneca, woodridge, montgomery and shorewood. 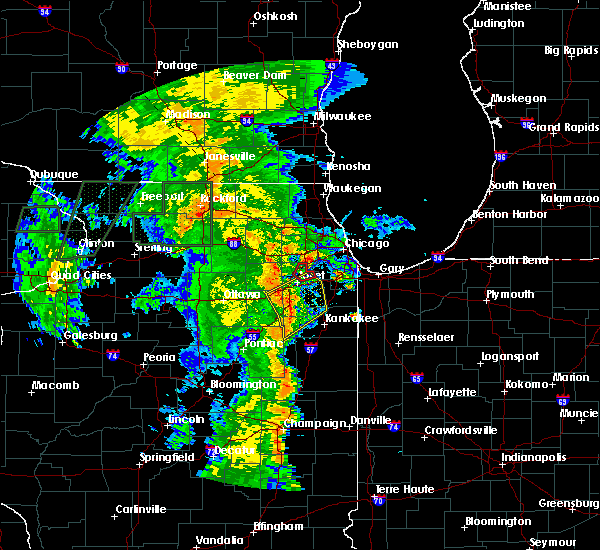 A tornado watch remains in effect until 100 am cdt for north central and northeastern illinois. 5/17/2017 11:50 PM CDT At 1150 pm cdt, severe thunderstorms were located along a line extending from oswego to 7 miles east of newark to near seneca, moving northeast at 55 mph (radar indicated). Hazards include 70 mph wind gusts. Expect considerable tree damage. Damage is likely to mobile homes, roofs, and outbuildings. 3/7/2017 1:13 AM CST At 111 am cst, severe thunderstorms were located along a line extending from inverness to woodridge to 6 miles northwest of herscher, moving east at 60 mph (radar indicated). Hazards include 60 mph wind gusts and quarter size hail. Hail damage to vehicles is expected. expect wind damage to roofs, siding, and trees. these severe storms will be near, schaumburg, hoffman estates, downers grove, rolling meadows, woodridge and darien around 115 am cst. 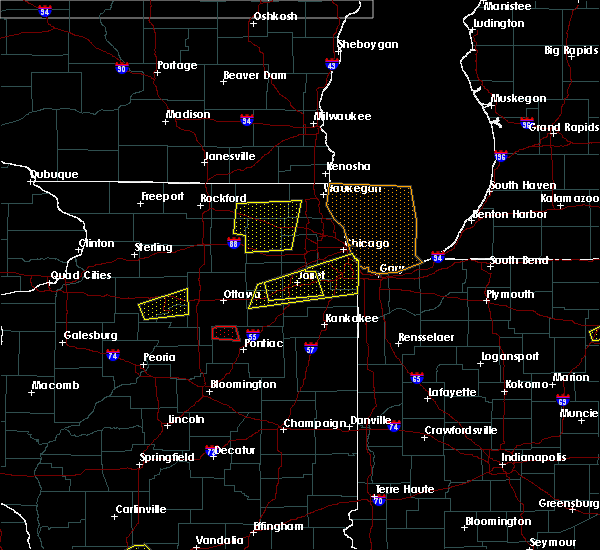 arlington heights, wheeling, westmont, hinsdale, willow springs and prospect heights around 120 am cst. 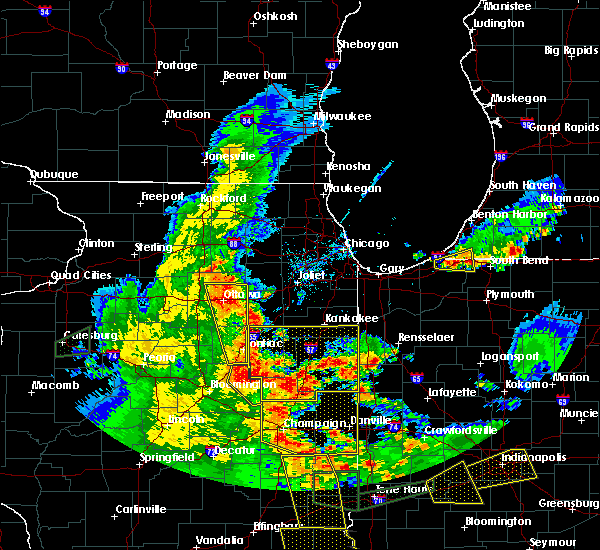 skokie, glenview, morton grove, brookfield, westchester, la grange, forest park and justice around 125 am cst. 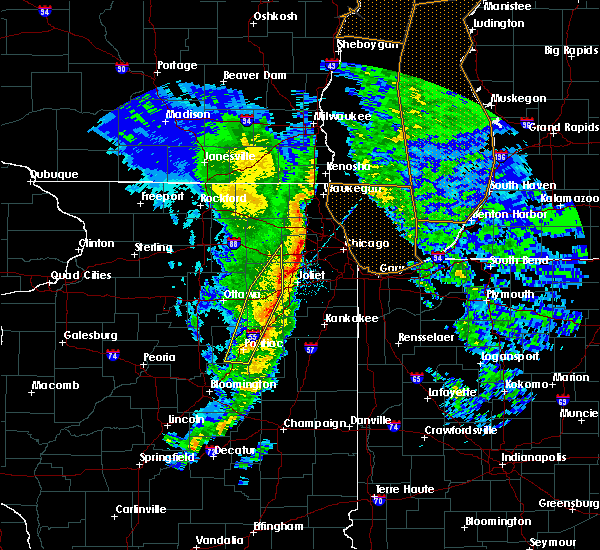 cicero, oak lawn, bourbonnais, winnetka, and stickney around 130 am cst. Northerly island, lincoln park, douglas park, hyde park and lakeview around 135 am cst. 3/7/2017 1:03 AM CST At 102 am cst, severe thunderstorms were located along a line extending from east dundee to near aurora to near dwight, moving east at 60 mph (radar indicated). Hazards include 60 mph wind gusts and quarter size hail. Hail damage to vehicles is expected. expect wind damage to roofs, siding, and trees. 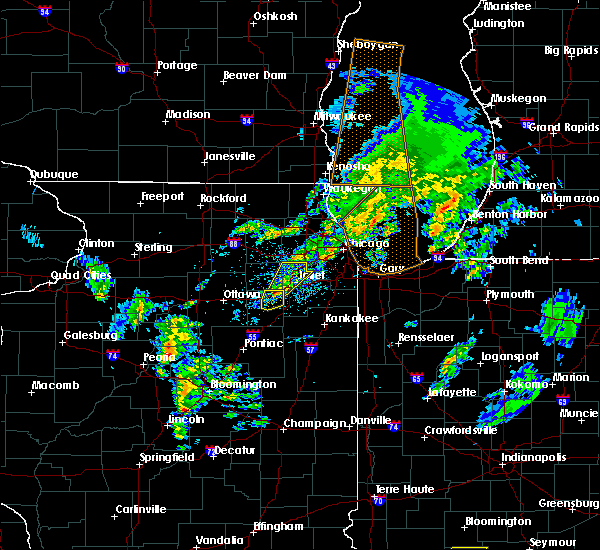 these severe storms will be near, naperville, elgin, and warrenville around 105 am cst. 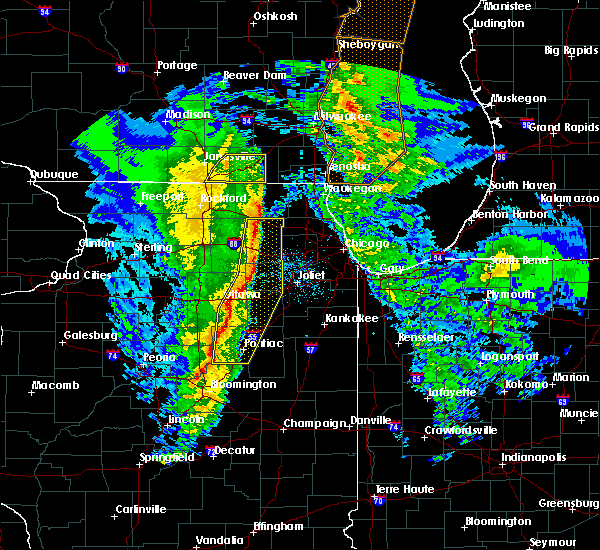 bolingbrook, wheaton, romeoville, streamwood, and inverness around 110 am cst. 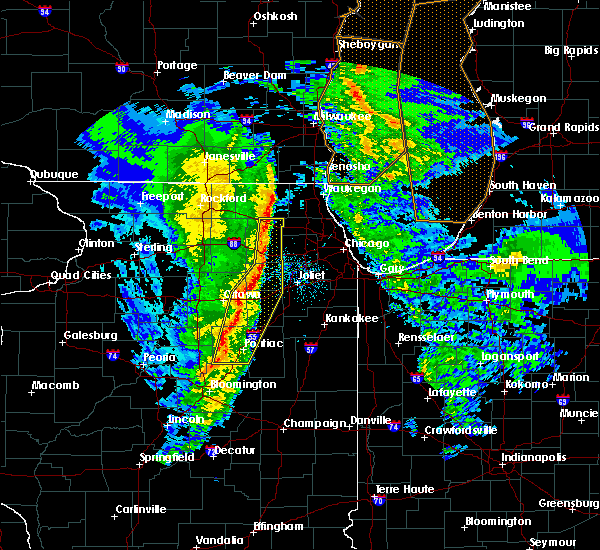 schaumburg, downers grove, westmont, rolling meadows, york center, and darien around 115 am cst. 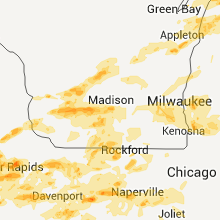 arlington heights, des plaines, mount prospect, wheeling, hinsdale, oak brook, willow springs and palos hills around 120 am cst. 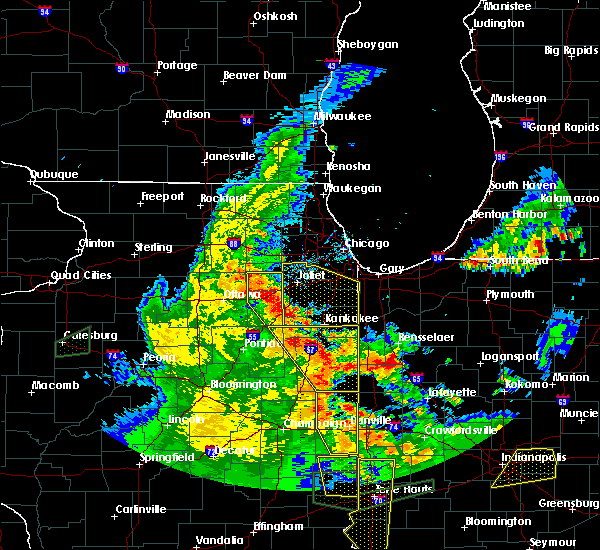 skokie, northbrook, maywood, morton grove, brookfield, and justice around 125 am cst. 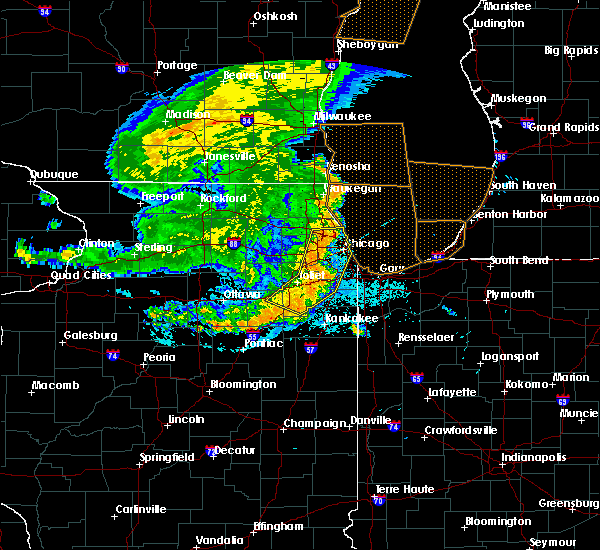 cicero, wilmette, bourbonnais, bradley, winnetka, and stickney around 130 am cst. Chatham, navy pier, lincoln park, hyde park and lakeview around 135 am cst. 3/7/2017 12:43 AM CST At 1242 am cst, severe thunderstorms were located along a line extending from sycamore to near newark to near flanagan, moving northeast at 80 mph (radar indicated). Hazards include 60 mph wind gusts. Expect damage to roofs, siding, and trees. severe thunderstorms will be near, maple park, newark and virgil around 1245 am cst. yorkville, plano and lily lake around 1250 am cst. elgin and oswego around 1255 am cst. aurora, naperville, west dundee and odell around 100 am cst. hoffman estates, romeoville, dwight, and inverness around 105 am cst. 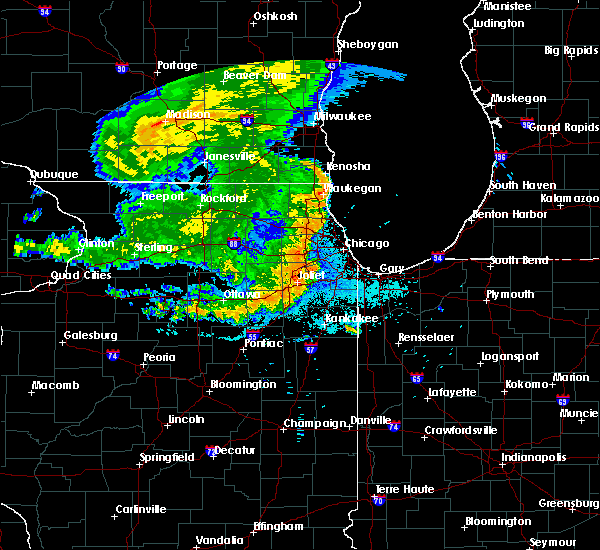 bolingbrook, palatine, wheaton, downers grove, glen ellyn, lisle, woodridge, darien and gardner around 110 am cst. Cicero, westchester, forest park and river forest around 120 am cst. 2/28/2017 10:31 PM CST At 1030 pm cst, severe thunderstorms were located along a line extending from near sugar grove to near plainfield to near minooka, moving northeast at 60 mph (radar indicated). Hazards include 60 mph wind gusts and penny size hail. Expect damage to roofs, siding, and trees. 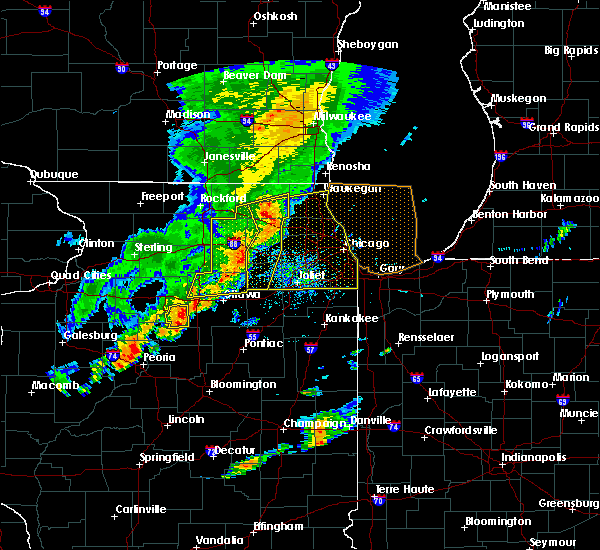 these severe storms will be near, joliet and naperville around 1035 pm cst. 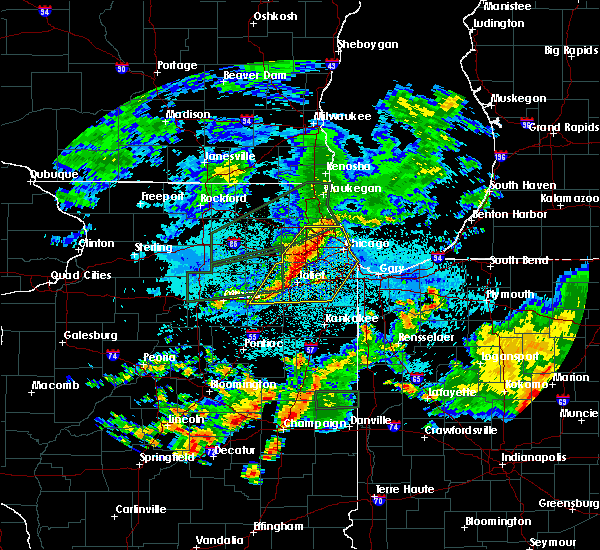 bolingbrook, romeoville, batavia, warrenville and rockdale around 1040 pm cst. wheaton, lockport and winfield around 1045 pm cst. other locations impacted by these severe thunderstorms include preston heights, crystal lawns, lisbon, crest hill, boulder hill, millington and fairmont. 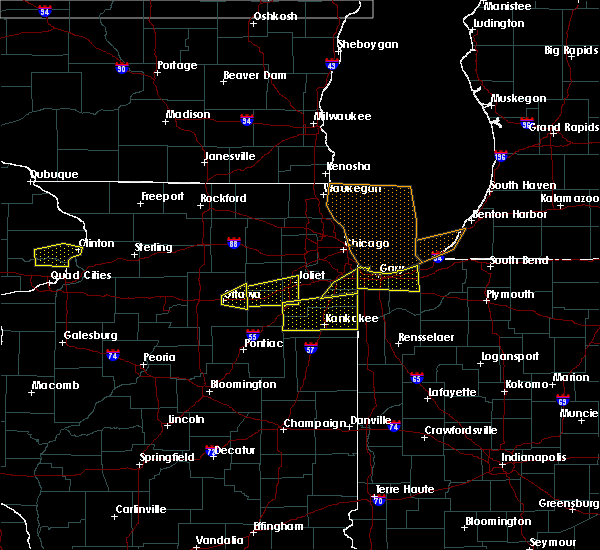 A tornado watch remains in effect until 400 am cst for northeastern illinois. 2/28/2017 10:18 PM CST At 1017 pm cst, severe thunderstorms were located along a line extending from near little rock to near yorkville to near morris, moving northeast at 65 mph (radar indicated). Hazards include 60 mph wind gusts and quarter size hail. Hail damage to vehicles is expected. expect wind damage to roofs, siding, and trees. 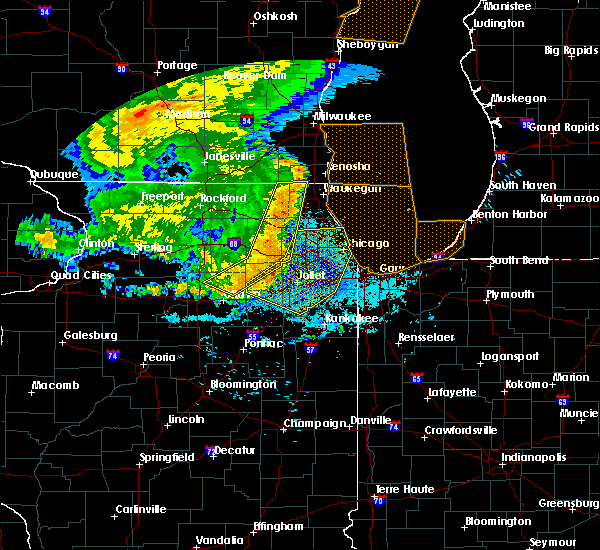 severe thunderstorms will be near, oswego around 1025 pm cst. 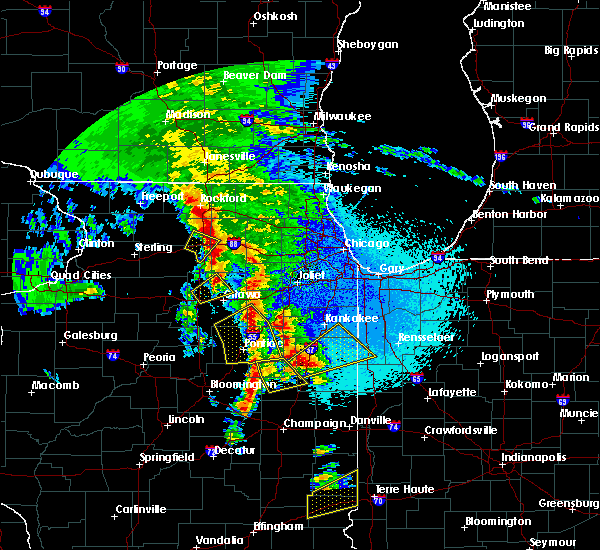 aurora, naperville, minooka, montgomery and sugar grove around 1030 pm cst. joliet, plainfield, channahon, north aurora and shorewood around 1035 pm cst. 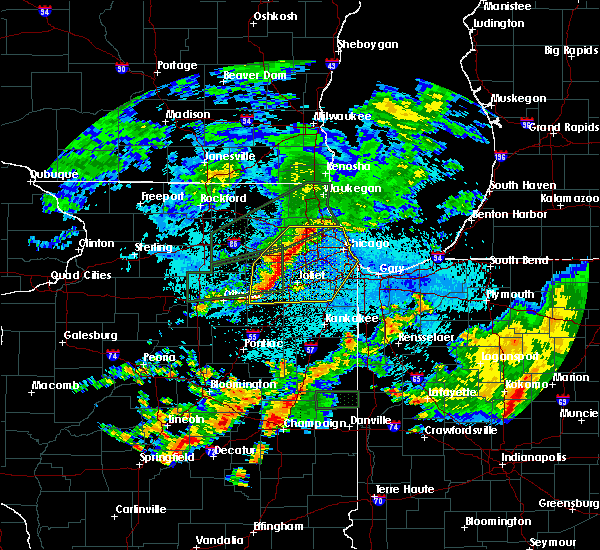 bolingbrook, romeoville, west chicago, batavia, warrenville and rockdale around 1040 pm cst. wheaton, lockport and winfield around 1045 pm cst. 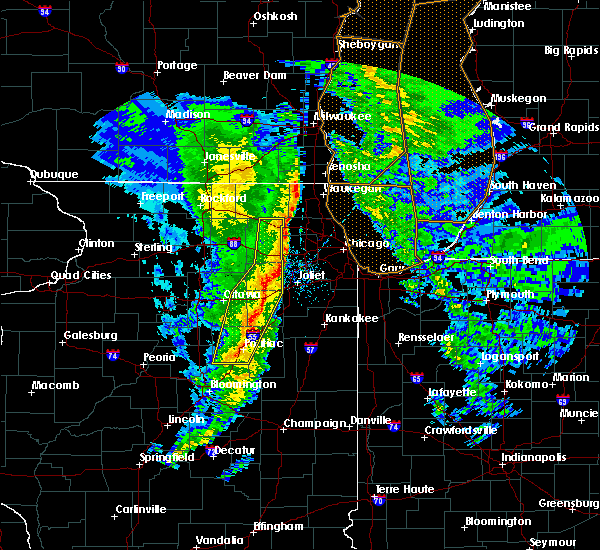 A tornado watch remains in effect until 400 am cst for north central and northeastern illinois. 2/28/2017 8:26 PM CST The severe thunderstorm warning for northern grundy county will expire at 830 pm cst, the storm which prompted the warning has weakened below severe limits, and has exited the warned area. therefore, the warning will be allowed to expire. 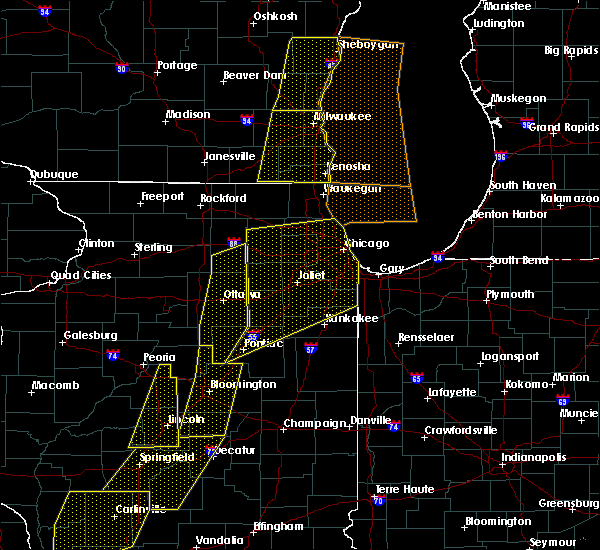 a tornado watch remains in effect until 1000 pm cst for northeastern illinois. 2/28/2017 8:13 PM CST At 812 pm cst, a severe thunderstorm was located over morris, moving east at 50 mph (radar indicated). Hazards include 60 mph wind gusts and half dollar size hail. Hail damage to vehicles is expected. expect wind damage to roofs, siding, and trees. locations impacted include, morris, channahon and minooka. A tornado watch remains in effect until 1000 pm cst for northeastern illinois. 2/28/2017 8:04 PM CST At 804 pm cst, a severe thunderstorm was located near seneca, moving east at 50 mph (radar indicated). Hazards include 60 mph wind gusts and half dollar size hail. Hail damage to vehicles is expected. Expect wind damage to roofs, siding, and trees. 2/28/2017 7:45 PM CST At 745 pm cst, a severe thunderstorm was located near channahon, moving east at 45 mph (radar indicated). Hazards include 60 mph wind gusts and quarter size hail. Hail damage to vehicles is expected. Expect wind damage to roofs, siding, and trees. 2/28/2017 7:17 PM CST At 717 pm cst, a severe thunderstorm was located over morris, moving east at 45 mph (radar indicated). Hazards include 60 mph wind gusts and quarter size hail. Hail damage to vehicles is expected. expect wind damage to roofs, siding, and trees. locations impacted include, joliet, plainfield, morris, channahon, minooka, seneca, shorewood, elwood, rockdale, crest hill, lisbon and crystal lawns. 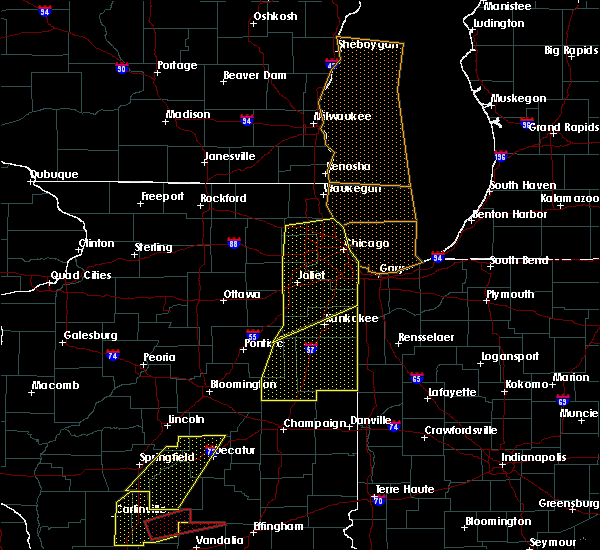 A tornado watch remains in effect until 1000 pm cst for north central and northeastern illinois. 2/28/2017 7:04 PM CST At 704 pm cst, a severe thunderstorm was located near seneca, moving east at 45 mph (radar indicated). Hazards include 60 mph wind gusts and quarter size hail. Hail damage to vehicles is expected. Expect wind damage to roofs, siding, and trees. 2/28/2017 6:19 PM CST At 619 pm cst, severe thunderstorms were located along a line extending from near dolton to morris, moving east at 35 mph (radar indicated). Hazards include golf ball size hail and 60 mph wind gusts. People and animals outdoors will be injured. expect hail damage to roofs, siding, windows, and vehicles. expect wind damage to roofs, siding, and trees. 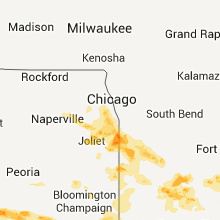 locations impacted include, chicago, joliet, hammond, orland park, tinley park, oak lawn, romeoville, calumet city, chicago heights, lansing, lockport, new lenox, homer glen, blue island, munster, dolton, park forest, alsip, matteson and mokena. A tornado watch remains in effect until 1000 pm cst for northeastern illinois, and northwestern indiana. 2/28/2017 6:00 PM CST At 559 pm cst, three severe thunderstorms were located along a line extending from orland park to near morris, moving east at 50 mph (radar indicated). Hazards include golf ball size hail and 60 mph wind gusts. People and animals outdoors will be injured. expect hail damage to roofs, siding, windows, and vehicles. Expect wind damage to roofs, siding, and trees. 2/28/2017 5:50 PM CST At 550 pm cst, two severe thunderstorms were located along a line extending from near minooka to near ingalls park, moving east at 45 mph (radar indicated). Hazards include golf ball size hail. People and animals outdoors will be injured. expect damage to roofs, siding, windows, and vehicles. locations impacted include, joliet, romeoville, plainfield, lockport, new lenox, homer glen, mokena, frankfort, morris, channahon, minooka, ingalls park, shorewood, manhattan, elwood, rockdale, goodings grove, crest hill, preston heights and crystal lawns. A tornado watch remains in effect until 1000 pm cst for northeastern illinois. 2/28/2017 5:28 PM CST At 527 pm cst, a severe thunderstorm was located near minooka, moving east at 40 mph (radar indicated). Hazards include golf ball size hail. People and animals outdoors will be injured. Expect damage to roofs, siding, windows, and vehicles. 2/28/2017 5:18 PM CST At 517 pm cst, a confirmed large and extremely dangerous tornado was located north of morris, moving east at 45 mph. this is a particularly dangerous situation. take cover now! (weather spotters confirmed tornado). Hazards include damaging tornado. You are in a life-threatening situation. flying debris may be deadly to those caught without shelter. mobile homes will be destroyed. considerable damage to homes, businesses, and vehicles is likely and complete destruction is possible. the tornado will be near, morris around 520 pm cst. channahon and minooka around 530 pm cst. Other locations impacted by this tornadic thunderstorm include lisbon. 2/28/2017 5:04 PM CST At 504 pm cst, a confirmed large and extremely dangerous tornado was located over marseilles, moving east at 35 mph. this is a particularly dangerous situation. take cover now! (weather spotters confirmed tornado). Hazards include damaging tornado. You are in a life-threatening situation. flying debris may be deadly to those caught without shelter. mobile homes will be destroyed. considerable damage to homes, businesses, and vehicles is likely and complete destruction is possible. the tornado will be near, morris around 525 pm cst. minooka around 530 pm cst. Other locations impacted by this tornadic thunderstorm include carbon hill and lisbon. 2/28/2017 4:51 PM CST At 450 pm cst, a confirmed large and extremely dangerous tornado was located over ottawa, moving east at 45 mph. this is a particularly dangerous situation. take cover now! (weather spotters confirmed tornado). Hazards include damaging tornado. You are in a life-threatening situation. flying debris may be deadly to those caught without shelter. mobile homes will be destroyed. considerable damage to homes, businesses, and vehicles is likely and complete destruction is possible. the tornado will be near, marseilles around 455 pm cst. seneca around 505 pm cst. morris around 520 pm cst. channahon and minooka around 530 pm cst. other locations impacted by this tornadic thunderstorm include carbon hill and lisbon. this includes, gebhard woods state park, grundy county speedway and fairgrounds, illini state park, and william g stratton state park. Including the following interstate, i-80 between mile markers 93 and 121. 7/17/2016 10:36 PM CDT At 1036 pm cdt, a severe thunderstorm was located near mazon, or near seneca, moving northeast at 40 mph (radar indicated). Hazards include 60 mph wind gusts. Expect damage to roofs. siding. and trees. this severe thunderstorm will be near, mazon around 1040 pm cdt. morris around 1050 pm cdt. braidwood, coal city and diamond around 1055 pm cdt. 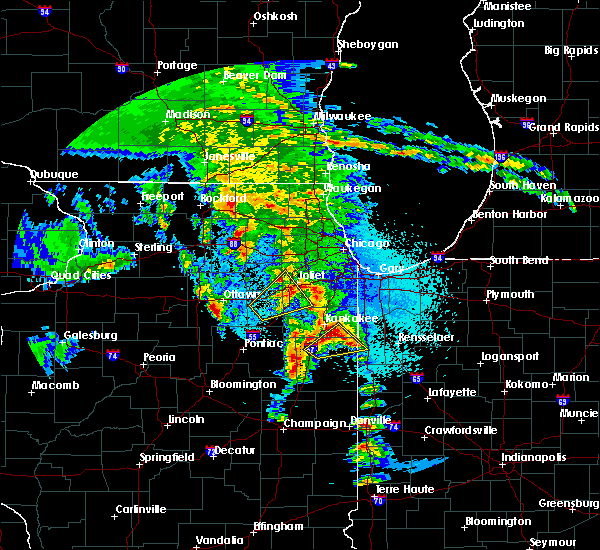 channahon and minooka around 1100 pm cdt. other locations impacted by this severe thunderstorm include godley, east brooklyn, verona, ransom, south wilmington, carbon hill and kinsman. including the following interstates, i-55 between mile markers 220 and 233. I-80 between mile markers 109 and 116. 7/13/2016 6:42 PM CDT The severe thunderstorm warning for southeastern kendall and northeastern grundy counties will expire at 645 pm cdt. the storms which prompted the warning have moved out of the area. therefore the warning will be allowed to expire. however gusty winds and heavy rain are still possible with these thunderstorms. A severe thunderstorm watch remains in effect until 900 pm cdt for. 7/13/2016 6:36 PM CDT At 635 pm cdt, severe thunderstorms were located along a line extending from 5 miles southeast of yorkville to kankakee, moving east at 45 mph. winds of 65 mph were measured by trained storm spotters near the community of newark at 615 pm cdt with these storms (trained weather spotters). Hazards include 70 mph wind gusts and quarter size hail. Hail damage to vehicles is expected. expect considerable tree damage. wind damage is also likely to mobile homes, roofs, and outbuildings. locations impacted include, joliet, yorkville, morris, channahon, minooka, coal city, diamond, godley and carbon hill. including the following interstates, i-55 near mile marker 232. I-80 between mile markers 114 and 122. 7/13/2016 6:34 PM CDT At 632 pm cdt, severe thunderstorms were located along a line extending from 5 miles southeast of yorkville to kankakee, moving east at 45 mph. 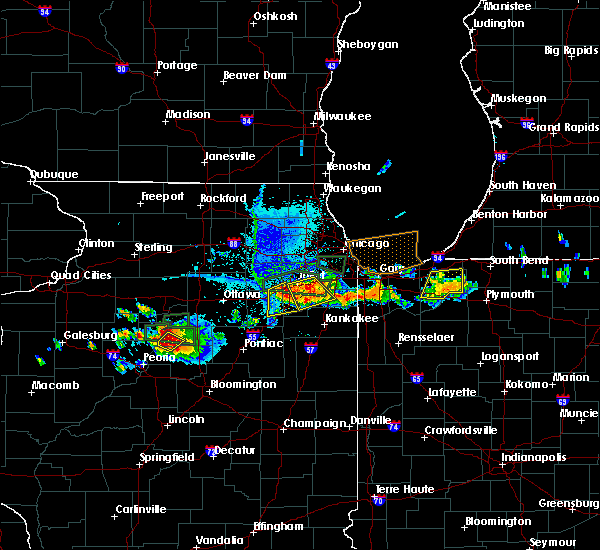 winds of 65 mph were measured by trained storm spotters near the community of newark at 615 pm cdt with these storms. the most intense winds with these storms are moving into the southwest chicago suburbs, including plainfield, joliet, and romeoville (trained weather spotters). Hazards include 70 mph wind gusts and half dollar size hail. Hail damage to vehicles is expected. expect considerable tree damage. wind damage is also likely to mobile homes, roofs, and outbuildings. 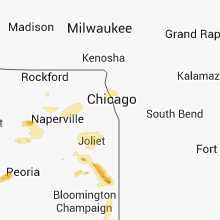 Locations impacted include, aurora, joliet, naperville, bolingbrook, orland park, tinley park, romeoville, plainfield, chicago heights, lansing, kankakee, lockport, new lenox, homer glen, munster, park forest, matteson, mokena, bourbonnais and frankfort. 7/13/2016 6:24 PM CDT At 623 pm cdt, severe thunderstorms were located along a line extending from 5 miles south of yorkville to near gardner, moving east at 35 mph. winds of 65 mph were measured by trained storm spotters near the community of newark at 615 pm cdt with these storms (trained weather spotters). Hazards include 70 mph wind gusts and quarter size hail. Hail damage to vehicles is expected. expect considerable tree damage. wind damage is also likely to mobile homes, roofs, and outbuildings. locations impacted include, joliet, yorkville, morris, channahon, minooka, coal city, diamond, gardner, newark, braceville, south wilmington, millington, godley, carbon hill, lisbon and east brooklyn. this includes, gebhard woods state park, grundy county speedway and fairgrounds, and william g stratton state park. including the following interstates, i-55 between mile markers 227 and 232. I-80 between mile markers 105 and 122. 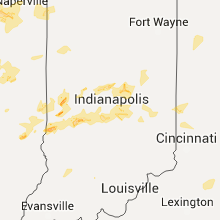 7/13/2016 6:22 PM CDT At 620 pm cdt, severe thunderstorms were located along a line extending from 6 miles south of yorkville to near ashkum, moving east at 50 mph. winds of 65 mph were measured by trained storm spotters near the community of newark at 615 pm cdt with these storms (trained weather spotters). Hazards include 70 mph wind gusts and quarter size hail. Hail damage to vehicles is expected. expect considerable tree damage. wind damage is also likely to mobile homes, roofs, and outbuildings. 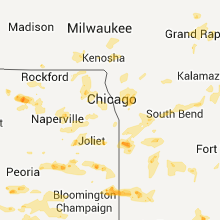 locations impacted include, aurora, joliet, naperville, bolingbrook, orland park, tinley park, romeoville, plainfield, chicago heights, lansing, kankakee, lockport, new lenox, homer glen, munster, park forest, matteson, mokena, bourbonnais and frankfort. this includes, university of st. Francis, channahon state park, chicagoland speedway route 66 raceway, first midwest bank amphitheatre, governors state university, joliet junior college, joliet slammers baseball, kankakee river state park, lewis university, olivet nazarine university, prairie state college, and will county fairgrounds. 7/13/2016 6:17 PM CDT At 617 pm cdt, severe thunderstorms were located along a line extending from 5 miles south of yorkville to near gardner, moving east at 35 mph (radar indicated). Hazards include 70 mph wind gusts and quarter size hail. Hail damage to vehicles is expected. expect considerable tree damage. wind damage is also likely to mobile homes, roofs, and outbuildings. locations impacted include, joliet, yorkville, morris, channahon, minooka, dwight, seneca, coal city, diamond, gardner, mazon, newark, braceville, south wilmington, millington, godley, carbon hill, lisbon and east brooklyn. this includes, gebhard woods state park, grundy county speedway and fairgrounds, and william g stratton state park. including the following interstates, i-55 between mile markers 220 and 232. I-80 between mile markers 104 and 122. 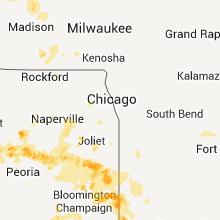 7/13/2016 6:13 PM CDT At 612 pm cdt, severe thunderstorms were located along a line extending from 5 miles south of yorkville to 15 miles southwest of kankakee, moving east at 50 mph. 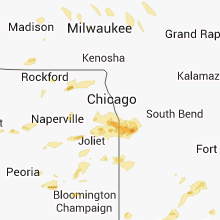 the most concentrated area of stronger winds is moving toward the southwest chicago metro area, including joliet (radar indicated). Hazards include 60 mph wind gusts and quarter size hail. Hail damage to vehicles is expected. Expect wind damage to roofs, siding, and trees. 7/13/2016 5:55 PM CDT At 553 pm cdt, severe thunderstorms were located along a line extending from near sheridan to 7 miles northeast of streator, moving east at 35 mph. these storms have a history of producing gusts in excess of 60 mph (radar indicated). Hazards include 60 mph wind gusts and quarter size hail. Hail damage to vehicles is expected. Expect wind damage to roofs, siding, and trees. 3/15/2016 10:21 PM CDT The severe thunderstorm warning for southeastern kendall, central grundy and southwestern will counties will expire at 1030 pm cdt, the storm which prompted the warning has weakened below severe limits, and no longer poses an immediate threat to life or property. therefore the warning will be allowed to expire. 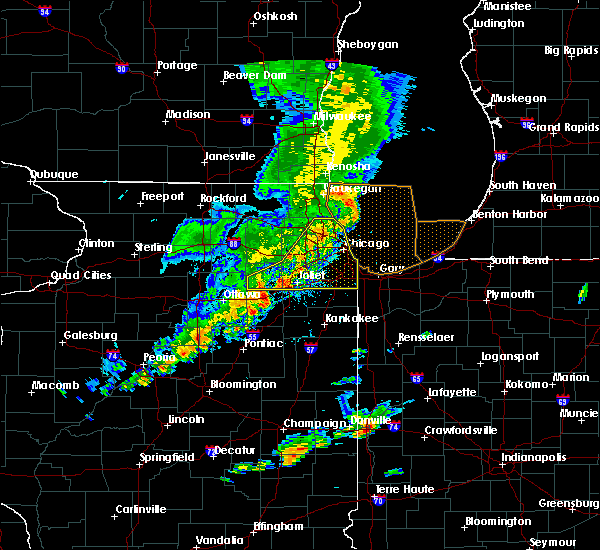 a severe thunderstorm watch remains in effect until 300 am cdt for northeastern illinois. 3/15/2016 10:06 PM CDT At 1006 pm cdt, a severe thunderstorm was located near morris, moving northeast at 50 mph (radar indicated). Hazards include 60 mph wind gusts and quarter size hail. Hail damage to vehicles is expected. expect wind damage to roofs, siding, and trees. locations impacted include, joliet, plainfield, morris, channahon, minooka, wilmington, shorewood, braidwood, coal city, diamond, elwood, rockdale, mazon, braceville, lakewood shores, crest hill, godley, carbon hill, symerton and crystal lawns. this includes, channahon state park, gebhard woods state park, grundy county speedway and fairgrounds, joliet junior college, and william g stratton state park. including the following interstates, i-55 between mile markers 230 and 257. I-80 between mile markers 108 and 131. 3/15/2016 9:54 PM CDT At 953 pm cdt, a severe thunderstorm was located near seneca, moving northeast at 50 mph (radar indicated). Hazards include 60 mph wind gusts and quarter size hail. Hail damage to vehicles is expected. Expect wind damage to roofs, siding, and trees. 11/11/2015 9:10 PM CST The severe thunderstorm warning for east central la salle, kendall, northwestern livingston, grundy and southeastern kane counties will expire at 915 pm cst, the storms which prompted the warning have weakened below severe limits, and exited the warning area. therefore the warning has been allowed to expire. gusts of 40 to 45 mph will remain possible through the remainder of the evening, while gusts in excess of 50 mph are possible overnight. to report severe weather, contact your nearest law enforcement agency. 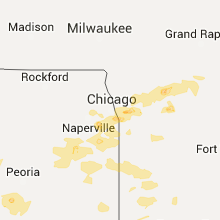 they will relay your report to the national weather service chicago. 11/11/2015 9:00 PM CST At 859 pm cst, strong to severe thunderstorms were located along a line extending from east dundee to near seneca, moving northeast at 55 mph. higher winds to 60 mph will likely be isolated in nature (radar indicated). Hazards include 60 mph wind gusts. Expect damage to roofs. siding and trees. Locations impacted include, aurora, joliet, oswego, west chicago, batavia, geneva, yorkville, morris, channahon, pontiac, minooka, dwight, seneca, montgomery, north aurora, odell, mazon, cornell, ransom and lisbon. 11/11/2015 8:44 PM CST At 843 pm cst, severe thunderstorms were located along a line extending from lily lake to 10 miles south of streator, moving northeast at 65 mph (radar indicated). Hazards include 60 mph wind gusts. Expect damage to roofs. siding and trees. 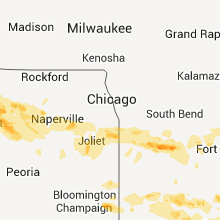 locations impacted include, aurora, joliet, elgin, carpentersville, st. Charles, oswego, algonquin, west chicago, batavia, geneva, yorkville, streator, morris, channahon, pontiac, minooka, plano, marseilles, dwight and sleepy hollow. 11/11/2015 8:30 PM CST At 828 pm cst, severe thunderstorms were located along a line extending from near hinckley to 5 miles east of wenona, moving northeast at 55 mph. 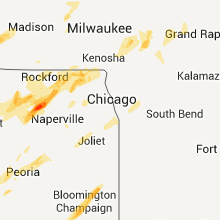 while the severe winds do not extend the entire length of this line of storms, there are scattered areas of likely severe winds based on radar, including in northern kane county, and entering kendall county (radar indicated). Hazards include 60 mph wind gusts. Expect damage to roofs. Siding and trees. 9/19/2015 12:07 AM CDT At 1207 am cdt, severe thunderstorms were located along a line extending from northlake to near romeoville to morris, moving east at 45 mph (radar indicated). Hazards include 60 mph wind gusts. Expect damage to roofs. siding and trees. 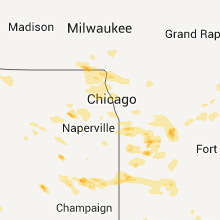 locations impacted include, chicago, aurora, joliet, naperville, cicero, arlington heights, evanston, schaumburg, bolingbrook, skokie, des plaines, orland park, tinley park, oak lawn, berwyn, mount prospect, wheaton, hoffman estates, oak park and downers grove. this includes, argonne national laboratory, brookfield zoo, lincoln park zoo, loyola university, oakton community college, toyota park, triton college, university of chicago, university of st. francis, windy city thunderbolts baseball, benedictine university, channahon state park, chicagoland speedway route 66 raceway, college of dupage, dupage county fairgrounds, first midwest bank amphitheatre, gebhard woods state park, grundy county speedway and fairgrounds, hawthorne park, joliet junior college, joliet slammers baseball, lewis university, moraine valley community college, morton arboretum, northeastern illinois university, northwestern university, university of illinois chicago, us cellular field, il institute of technology, wheaton college, william g stratton state park, wrigley field, the loop, and museum of science and industry. including the following interstates, i-55 between mile markers 241 and 293. i-57 between mile markers 330 and 358. i-80 between mile markers 106 and 155. i-88 between mile markers 121 and 140. i-94 between mile markers 36 and 68. i-290 between mile markers 1 and 29. i-294 between mile markers 36 and 68. I-355 between mile markers 1 and 30. 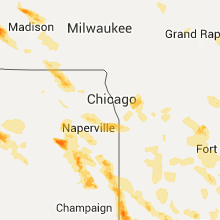 9/18/2015 11:54 PM CDT At 1154 pm cdt, severe thunderstorms were located along a line extending from wheaton to near oswego to near seneca, moving east at 45 mph (radar indicated). Hazards include 60 mph wind gusts. Expect damage to roofs. Siding and trees. 8/18/2015 7:44 PM CDT At 743 pm cdt, severe thunderstorms were located along a line extending from minooka to near channahon to near lakewood shores, moving northeast at 65 mph (radar indicated). Hazards include 70 mph wind gusts. Expect considerable tree damage. damage is likely to mobile homes, roofs and outbuildings. 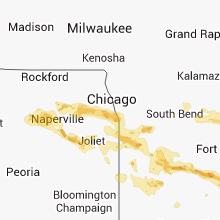 locations impacted include, joliet, romeoville, lockport, new lenox, mokena, frankfort, morris, channahon, minooka, manteno, wilmington, ingalls park, shorewood, manhattan, braidwood, coal city, diamond, elwood, rockdale and braceville. this includes, university of st. francis, channahon state park, chicagoland speedway route 66 raceway, joliet junior college, joliet slammers baseball, and kankakee river state park. including the following interstates, i-55 between mile markers 230 and 254. i-57 between mile markers 323 and 324. i-80 between mile markers 114 and 143. i-355 between mile markers 1 and 7. A tornado watch remains in effect until 1000 pm cdt for northeastern illinois. 8/18/2015 7:36 PM CDT At 736 pm cdt, severe thunderstorms were located along a line extending from near morris to diamond to 7 miles northwest of herscher, moving northeast at 45 mph (radar indicated). Hazards include 60 mph wind gusts. Expect damage to roofs. Siding and trees. 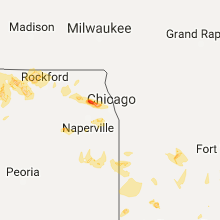 8/2/2015 11:42 PM CDT At 1140 pm cdt, severe thunderstorms were located along a line extending from near plainfield to near porter, moving southeast at 45 mph (radar indicated). Hazards include 60 mph wind gusts and quarter size hail. Hail damage to vehicles is expected. expect wind damage to roofs, siding and trees. 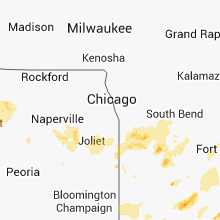 Locations impacted include, southern part of chicago, aurora, joliet, naperville, hammond, gary, bolingbrook, orland park, tinley park, oak lawn, romeoville, plainfield, calumet city, portage, merrillville, valparaiso, oswego, chicago heights, east chicago and schererville. 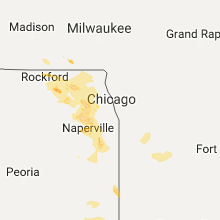 8/2/2015 11:22 PM CDT At 1121 pm cdt, severe thunderstorms were located along a line extending from near sugar grove to 6 miles northeast of whiting, moving southeast at 45 mph (radar indicated). Hazards include 60 mph wind gusts and quarter size hail. Hail damage to vehicles is expected. Expect wind damage to roofs, siding and trees. 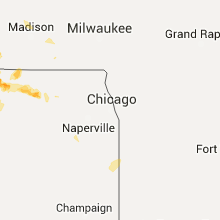 7/13/2015 6:38 PM CDT At 638 pm cdt, a severe thunderstorm was located over channahon, moving east at 35 mph (radar indicated). Hazards include 60 mph wind gusts and quarter size hail. Hail damage to vehicles is expected. expect wind damage to roofs, siding and trees. this severe thunderstorm will be near, elwood and rockdale around 645 pm cdt. new lenox and ingalls park around 655 pm cdt. manhattan around 700 pm cdt. 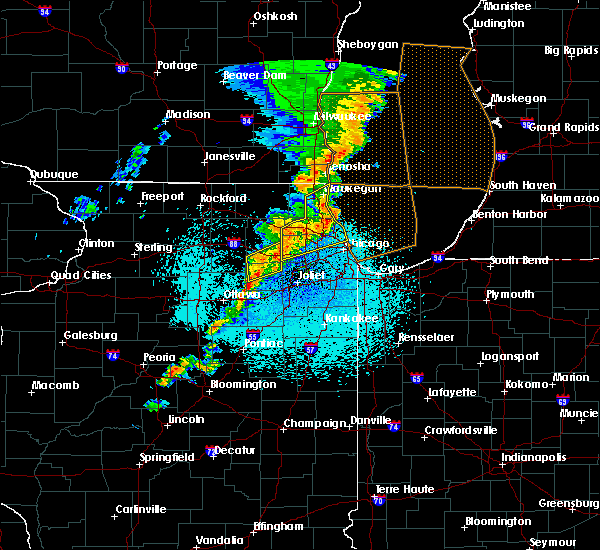 mokena around 705 pm cdt. other locations impacted by this severe thunderstorm include preston heights, symerton, frankfort square and crest hill. including the following interstates, i-55 between mile markers 241 and 255. i-80 between mile markers 119 and 140. this includes, university of st. francis, channahon state park, chicagoland speedway route 66 raceway, joliet junior college, and joliet slammers baseball. 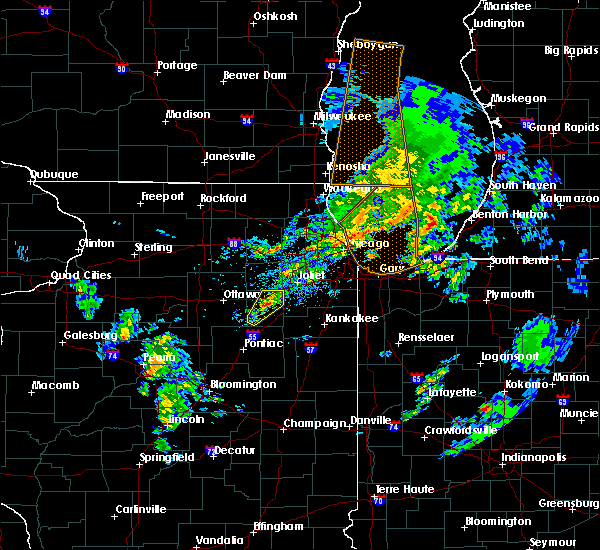 A tornado watch remains in effect until 1100 pm cdt for northeastern illinois. 6/10/2015 8:14 PM CDT A severe thunderstorm warning remains in effect until 845 pm cdt for southwestern will. southeastern kendall and northeastern grundy counties. at 813 pm cdt. a severe thunderstorm was located near wilmington. moving southeast at 15 mph. hazard. Two inch hail and 60 mph wind gusts. 6/10/2015 7:55 PM CDT At 754 pm cdt, a severe thunderstorm was located near channahon, moving southeast at 15 mph. this is a very dangerous storm (trained spotters. 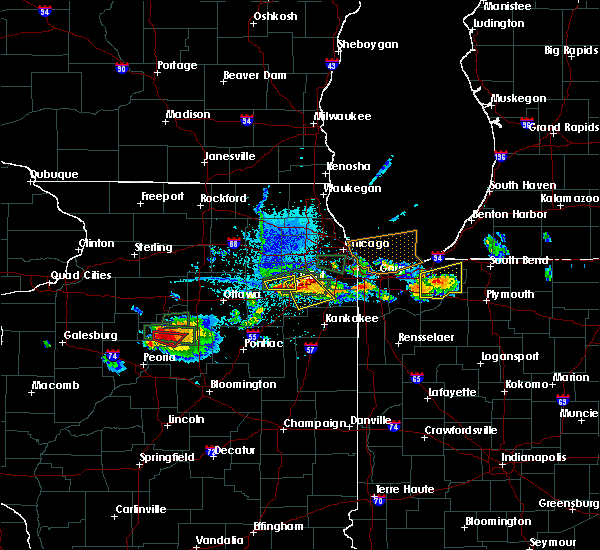 trained spotters reported baseball sized hail at 750 pm cdt in minooka). Hazards include baseball size hail and 60 mph wind gusts. People and animals outdoors will be severely injured. expect shattered windows, extensive damage to roofs, siding and vehicles. this severe storm will be near, diamond and elwood around 805 pm cdt. braidwood around 810 pm cdt. wilmington around 815 pm cdt. lakewood shores around 820 pm cdt. other locations impacted by this severe thunderstorm include lisbon, carbon hill, symerton and godley. this includes, channahon state park, grundy county speedway and fairgrounds, and william g stratton state park. including the following interstates, i-55 between mile markers 232 and 250. I-80 between mile markers 112 and 126. 6/10/2015 7:50 PM CDT Baseball sized hail reported 1.6 miles WSW of Minooka, IL, golf ball to baseball sized hail. 6/10/2015 7:45 PM CDT At 745 pm cdt, a severe thunderstorm was located near channahon, moving southeast at 15 mph (radar indicated). Hazards include two inch hail and 60 mph wind gusts. People and animals outdoors will be injured. expect hail damage to roofs, siding, windows and vehicles. Expect wind damage to roofs, siding and trees. 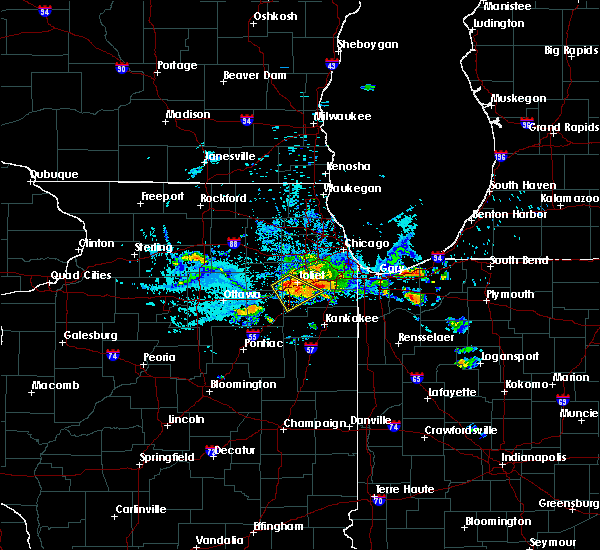 6/10/2015 7:36 PM CDT At 736 pm cdt, a severe thunderstorm was located over minooka, moving southeast at 15 mph (trained weather spotters). Hazards include two inch hail and 60 mph wind gusts. People and animals outdoors will be injured. expect hail damage to roofs, siding, windows and vehicles. expect wind damage to roofs, siding and trees. this severe storm will be near, channahon around 740 pm cdt. coal city and diamond around 745 pm cdt. other locations impacted by this severe thunderstorm include carbon hill and godley. this includes, channahon state park. including the following interstates, i-55 between mile markers 232 and 249. I-80 between mile markers 115 and 126. 6/10/2015 7:25 PM CDT Hen Egg sized hail reported 1.6 miles WSW of Minooka, IL, 2 inch diameter hail. 6/10/2015 7:21 PM CDT At 719 pm cdt, a severe thunderstorm was located near elwood, or near channahon, moving southeast at 25 mph (emergency management reported. at 716 pm cdt...emergency management reported golf ball sized hail in minooka). Hazards include golf ball size hail and 60 mph wind gusts. People and animals outdoors will be injured. expect hail damage to roofs, siding, windows and vehicles. expect wind damage to roofs, siding and trees. this severe storm will be near, wilmington and braidwood around 730 pm cdt. lakewood shores around 735 pm cdt. other locations impacted by this severe thunderstorm include carbon hill and godley. this includes, channahon state park. including the following interstates, i-55 between mile markers 232 and 249. I-80 between mile markers 115 and 126. 6/10/2015 7:20 PM CDT Grapefruit sized hail reported 1.6 miles WSW of Minooka, IL, softball size hail reported at camden drive and kettleson drive in minooka. photo via facebook. 6/10/2015 7:05 PM CDT At 705 pm cdt, a severe thunderstorm was located over channahon, moving southeast at 25 mph (radar indicated). Hazards include 60 mph wind gusts and quarter size hail. Hail damage to vehicles is expected. expect wind damage to roofs, siding and trees. this severe thunderstorm will be near, coal city and diamond around 725 pm cdt. wilmington and braidwood around 730 pm cdt. lakewood shores around 735 pm cdt. other locations impacted by this severe thunderstorm include carbon hill and godley. including the following interstates, i-55 between mile markers 232 and 249. i-80 between mile markers 115 and 126. This includes, channahon state park. 6/10/2015 6:54 PM CDT At 653 pm cdt, a severe thunderstorm was located near minooka, moving southeast at 15 mph (radar indicated). Hazards include 60 mph wind gusts and quarter size hail. Hail damage to vehicles is expected. expect wind damage to roofs, siding and trees. 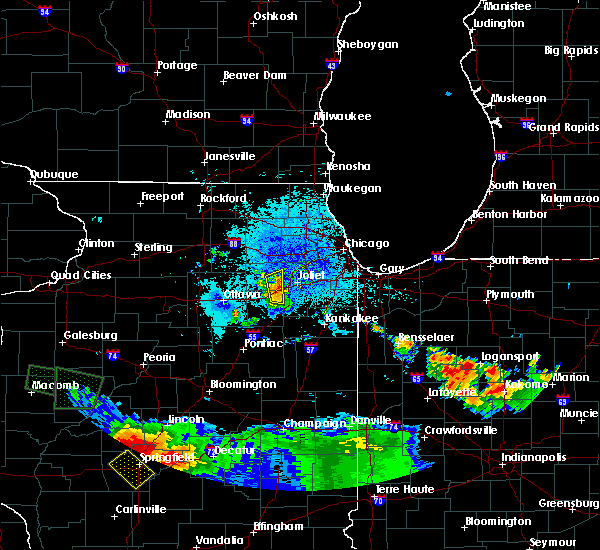 this severe storm will be near, joliet and minooka around 705 pm cdt. plainfield and shorewood around 710 pm cdt. channahon and rockdale around 715 pm cdt. other locations impacted by this severe thunderstorm include crystal lawns and crest hill. this includes, joliet junior college. including the following interstates, i-55 between mile markers 249 and 258. I-80 between mile markers 120 and 130. 6/10/2015 6:35 PM CDT At 635 pm cdt, a severe thunderstorm was located near yorkville, moving east at 25 mph (radar indicated). Hazards include 60 mph wind gusts and quarter size hail. Hail damage to vehicles is expected. Expect wind damage to roofs, siding and trees. 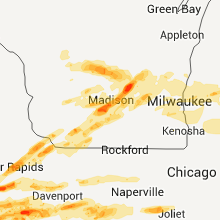 5/8/2015 3:58 PM CDT At 358 pm cdt, severe thunderstorms were located along a line extending from near newark to shorewood to new lenox, moving north at 30 mph (radar indicated). Hazards include 60 mph wind gusts. Expect damage to roofs. siding and trees. 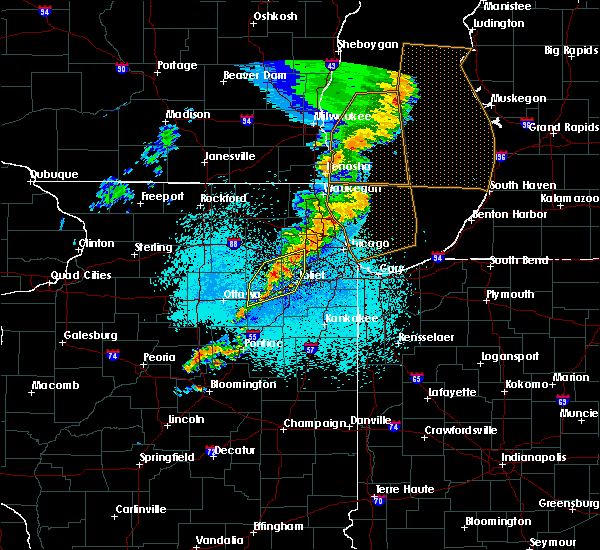 these severe storms will be near, plainfield around 405 pm cdt. lockport around 410 pm cdt. 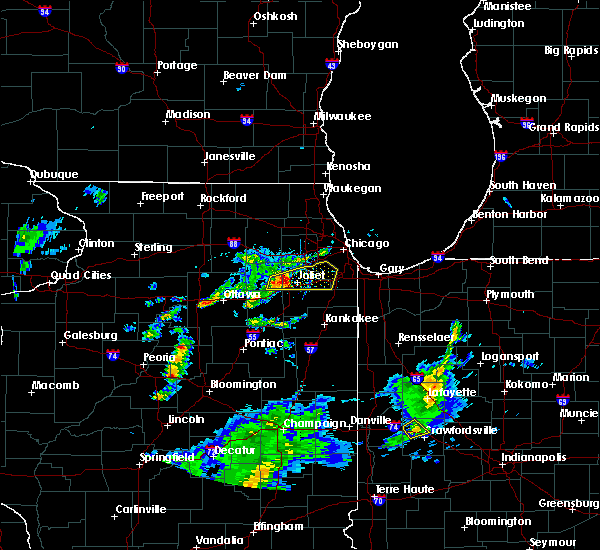 romeoville around 415 pm cdt. other locations impacted by these severe thunderstorms include fairmont, lisbon, crest hill, preston heights and crystal lawns. including the following interstates, i-55 between mile markers 245 and 257. i-80 between mile markers 115 and 140. i-355 near mile marker 1. 75in. 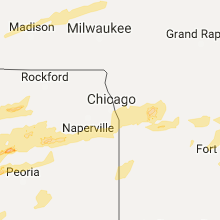 5/8/2015 3:43 PM CDT At 342 pm cdt, severe thunderstorms were located along a line extending from near newark to minooka to near elwood, moving northeast at 35 mph (radar indicated). Hazards include 60 mph wind gusts. Expect damage to roofs. siding and trees. 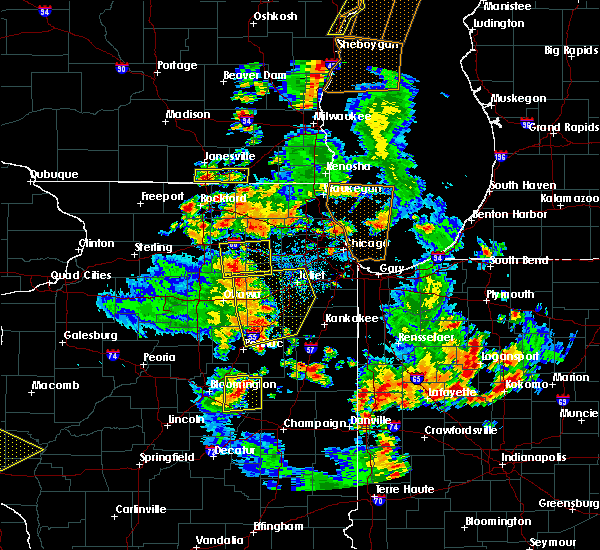 these severe storms will be near, manhattan and elwood around 350 pm cdt. joliet, new lenox, ingalls park, shorewood and rockdale around 355 pm cdt. plainfield around 400 pm cdt. lockport around 405 pm cdt. 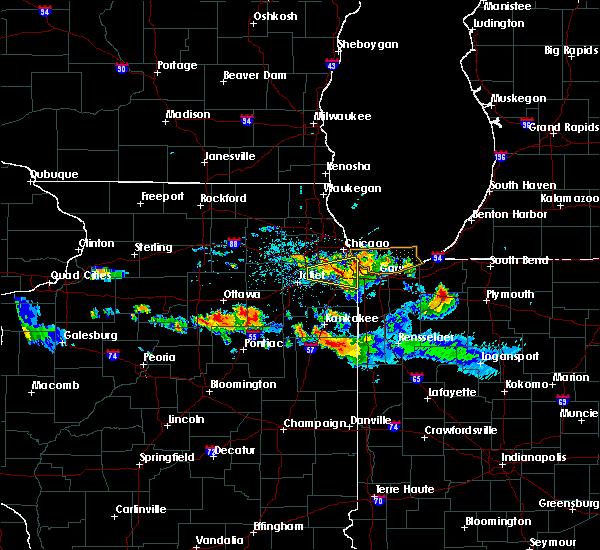 romeoville around 415 pm cdt. other locations impacted by these severe thunderstorms include fairmont, lisbon, crest hill, godley, crystal lawns, carbon hill and preston heights. including the following interstates, i-55 between mile markers 232 and 257. i-80 between mile markers 103 and 140. i-355 near mile marker 1. 75in. 5/8/2015 3:28 PM CDT At 328 pm cdt, severe thunderstorms were located along a line extending from seneca to near coal city to wilmington, moving northeast at 35 mph (radar indicated). Hazards include 60 mph wind gusts. Expect damage to roofs. siding and trees. severe thunderstorms will be near, wilmington and lakewood shores around 335 pm cdt. minooka, manhattan and elwood around 345 pm cdt. channahon around 350 pm cdt. 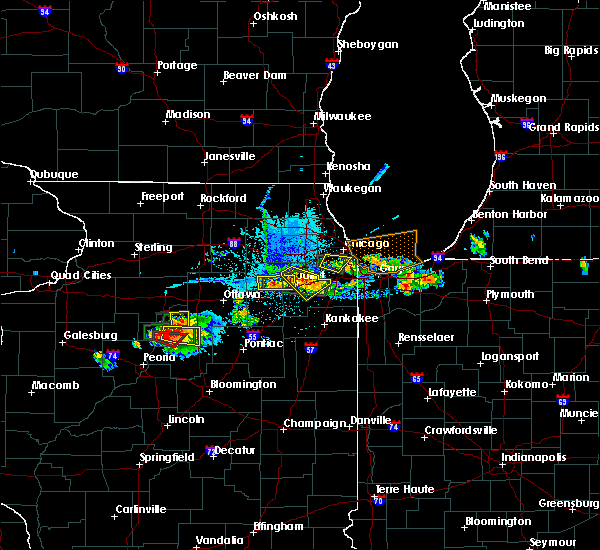 joliet, new lenox, ingalls park, shorewood and rockdale around 355 pm cdt. plainfield around 400 pm cdt. 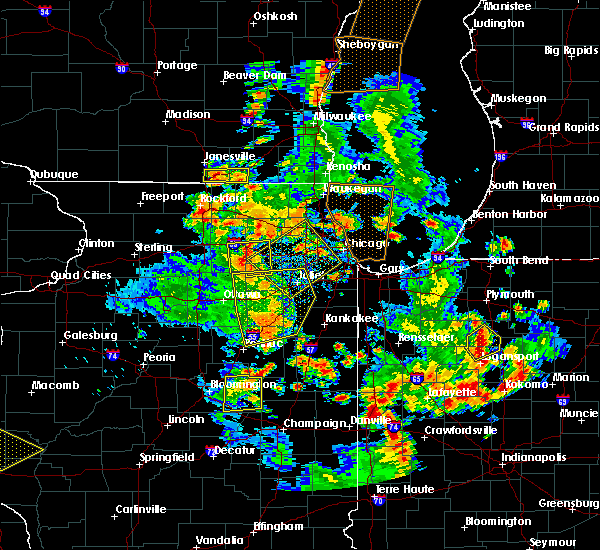 lockport around 410 pm cdt. 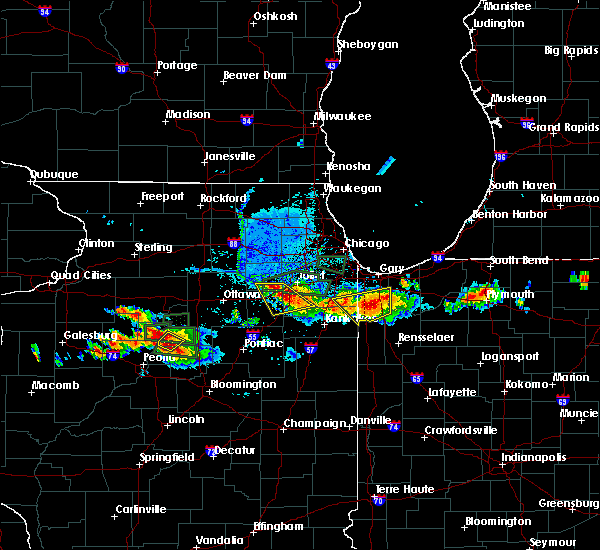 romeoville around 415 pm cdt. other locations impacted by these severe thunderstorms include fairmont, lisbon, crest hill, east brooklyn, godley, verona, crystal lawns, south wilmington, carbon hill and preston heights. 75in. 4/9/2015 9:11 PM CDT A severe thunderstorm warning remains in effect until 930 pm cdt for south central cook. northwestern will. southeastern dupage and southeastern kendall counties. 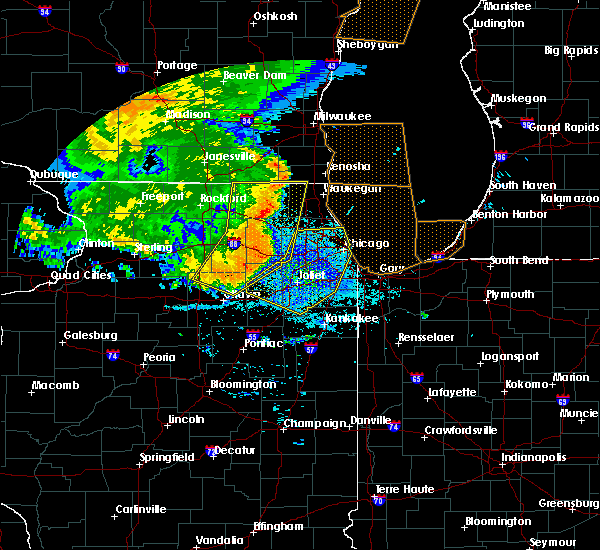 at 910 pm cdt. 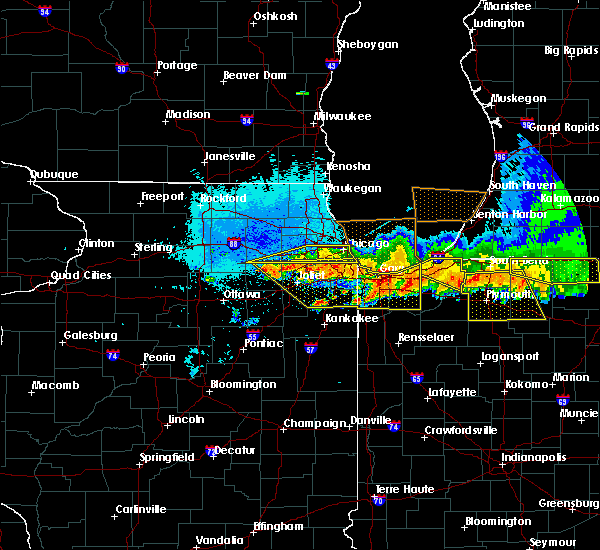 severe thunderstorms were located along a line extending from near romeoville to ingalls park. Moving northeast at 60 mph. 4/9/2015 9:03 PM CDT A severe thunderstorm warning remains in effect until 915 pm cdt for southwestern will. southeastern kendall and grundy counties. at 902 pm cdt. 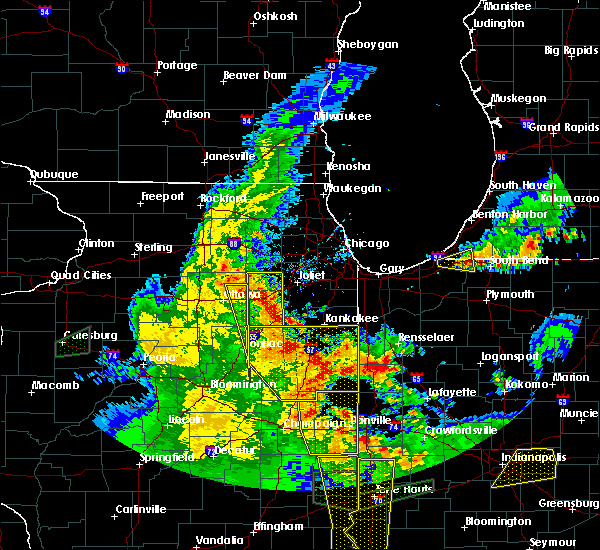 severe thunderstorms were located along a line extending from near shorewood to wilmington. moving northeast at 45 mph. hazard. 70 mph wind gusts and quarter size hail. 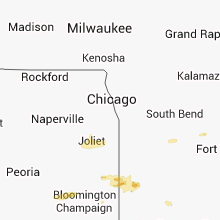 4/9/2015 8:58 PM CDT The national weather service in chicago has issued a * severe thunderstorm warning for. south central cook county in northeastern illinois. northwestern will county in northeastern illinois. southern dupage county in northeastern illinois. Eastern kendall county in northeastern illinois. 4/9/2015 8:40 PM CDT The national weather service in chicago has issued a * severe thunderstorm warning for. east central la salle county in north central illinois. 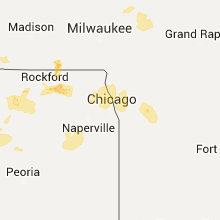 western will county in northeastern illinois. kendall county in northeastern illinois. Grundy county in northeastern illinois. 4/8/2015 11:32 PM CDT A severe thunderstorm warning remains in effect until midnight cdt for west central will and northeastern grundy counties. at 1131 pm cdt. a severe thunderstorm was located near channahon. moving northeast at 20 mph. hazard. half dollar size hail. source. Radar indicated. 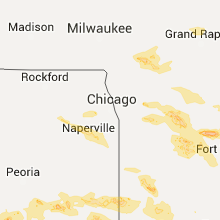 4/8/2015 11:13 PM CDT The national weather service in chicago has issued a * severe thunderstorm warning for. west central will county in northeastern illinois. 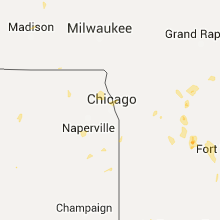 northeastern grundy county in northeastern illinois. until midnight cdt * at 1112 pm cdt. A severe thunderstorm was located near morris. 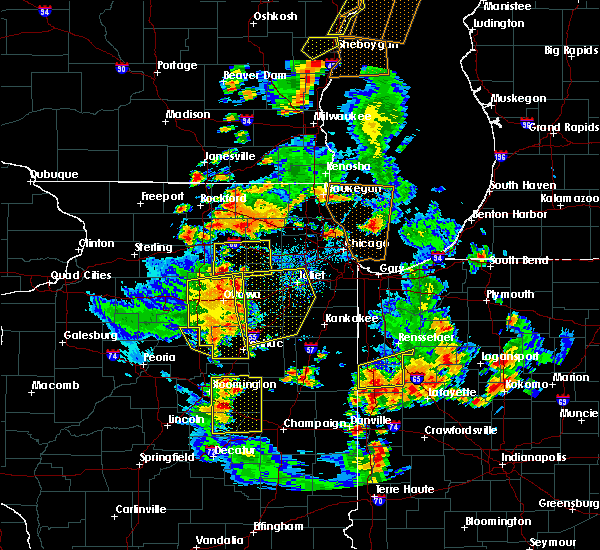 8/26/2014 10:36 AM CDT Half Dollar sized hail reported 0.3 miles W of Minooka, IL, reported on industrial drive. 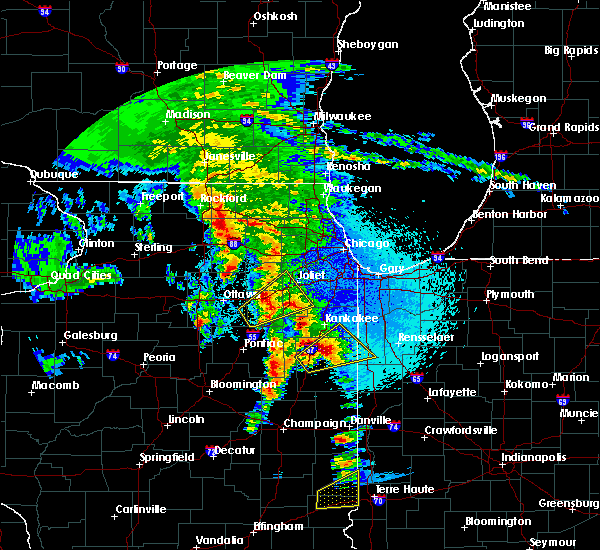 1/1/0001 12:00 AM Golf Ball sized hail reported 1.6 miles WSW of Minooka, IL, i-80 and ridge road. 1/1/0001 12:00 AM Quarter sized hail reported 1.6 miles WSW of Minooka, IL, minooka road 2 miles east of route 47. covering road. 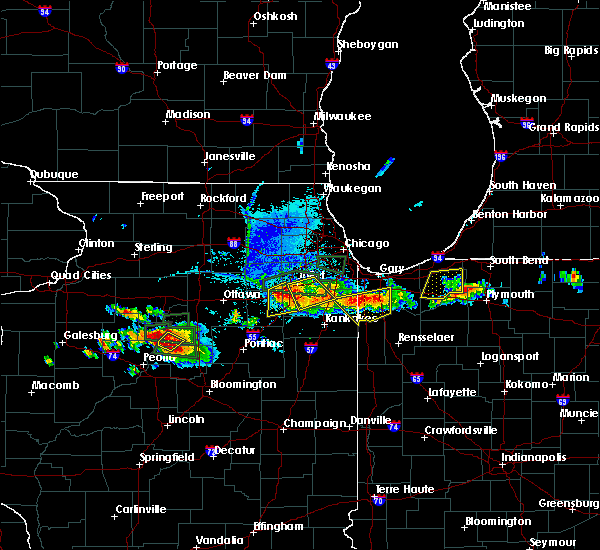 1/1/0001 12:00 AM Half Dollar sized hail reported 1.4 miles SSW of Minooka, IL, 1 inch hail covering roads. some 1 1/2 inch hail mixed in. 1/1/0001 12:00 AM Golf Ball sized hail reported 1.6 miles WSW of Minooka, IL, last two minutes.